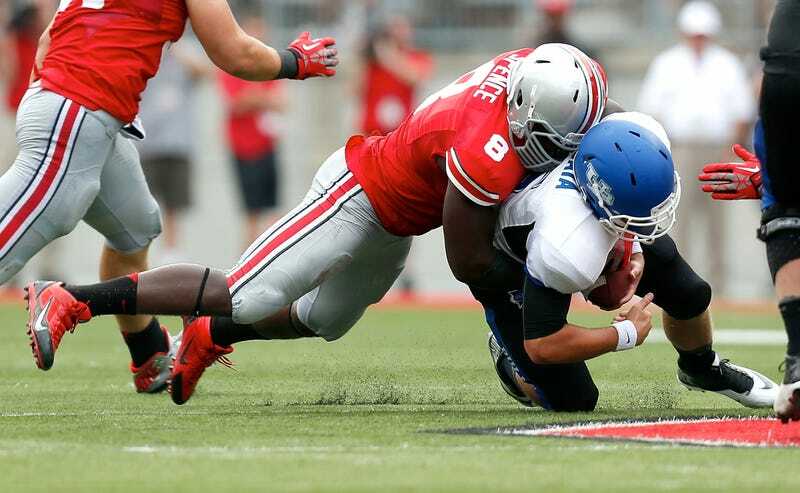 On New Year's Day it was announced that Ohio State's all-conference defensive end Noah Spence was suspended for three games, including the Orange Bowl. Now we know why. Spence's family says he tested positive for ecstasy, and had to argue his suspension down from a full season because the Big Ten considers ecstasy a performance-enhancing drug. Upon Spence's suspension, the OSU release indicated that his parents "did not agree with the rule violation nor the penalty imposed." Now we know they were trying to salvage his 2014. The Big Ten considers ecstasy, with effects that include dopamine and norepinephrine release and decreases in stress and anxiety, a PED. But, obviously, if a player is going to risk failing a drug test, there are more effective banned substances out there for pure performance enhancement without all the happy lovey side effects, and the NCAA pretty logically classifies ecstasy as a street drug, with a lesser attendant penalty. Spence's appeal succeeded in cutting his suspension down to the Orange Bowl and the first two games of next season. A second appeal, to overturn the suspension altogether, was denied. Spence's family now says they are planning a lawsuit against the Big Ten.